Apex’s Thermal Break System will reduce the conductivity in aluminum extrusions by separating the aluminum profile into two thermally broken parts. 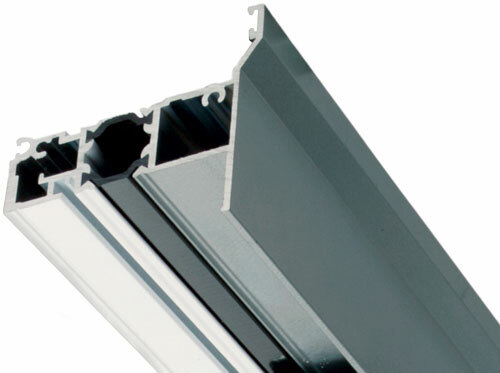 Both the inside and outside aluminum profiles are extruded independently with a cavity to accept the thermal strut. By joining the profiles with an insulated polyamide strip, the thermally broken aluminum profile can provide up to 533 times more insulation than a non-thermally broken extrusion. This thermal barrier will improve thermal performance while retaining the structural durability of the fenestration unit. As the two profiles are independently extruded and finished they can have different exterior and interior finishes to match the cost, performance and design requirements (i.e. clear anodized exterior and a white painted interior). An aluminum profile is designed and extruded with a strategically placed channel to capture the insulating polymer. A two-part resin is poured into the channel as a liquid that rapidly hardens into a strong, secure insulating element. After the polyurethane cures, the bottom aluminum section of the pocket is cut away, de-bridging the aluminum and leaving two thermally separated aluminum profiles.